Before catching a lovely acoustic show at the North Star (which totally has food now, by the way) I finally got a chance to stop at Sketch for their burgers. I’m not necessarily a burger person. I enjoy them on occasion, but I don’t go out of my way to try all the burger places around this town. But sometimes, you just want one. Sketch is in fishtown and yes, there are literally sketches all over the place. It’s on the tables, it’s on the walls, it’s everywhere. And they give you paper and drawing implements so you can create a sketch of your own! 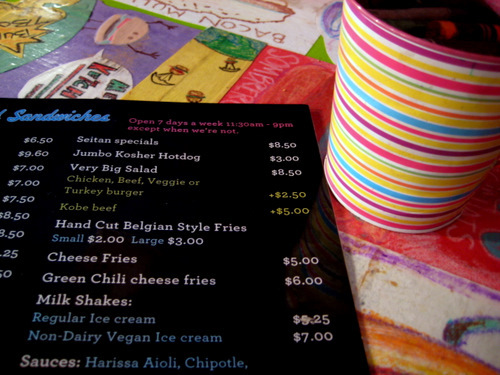 In addition to burgers, they have other random hot and cold items, as well as many vegan baked goods. The night I was there, they even had mac and cheese and korean fried chicken as some of their specials. I told you it was random. 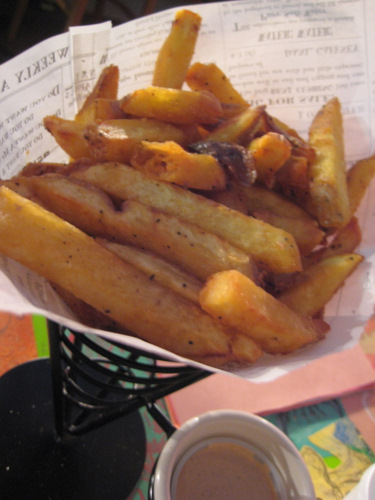 The hot, piping, thick cut fries. C ordered these and then ate like three of them. I tried one. They are ok, but a tad too thick for my tastes. They give you a chipotle dipping sauce. And they serve them in the cone, like they do in the belgian spots. Here is C’s cyclops burger. 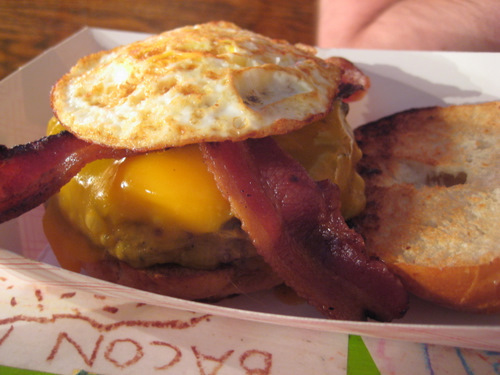 It comes with cheese, bacon, and a fried egg. Word. He ate this up like it was his death row meal. You really can’t go wrong with bacon on your burger. And you certainly can’t go wrong with a fried egg on anything. I just got a plain old burger with provolone cheese and fried onions. Look how gorgeous those onions are and how many there are! I was already happy before I even tried it! 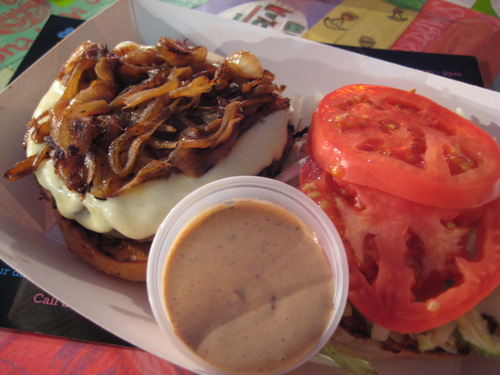 It also comes with shredded lettuce and two thick slices of a beautiful ripe tomato. You can get some sauces for your burger so I got some chipotle to try. It was fine, but I ended up just sticking with good ‘ol ketchup. This is a very substantial burger. As you can see, there is plenty of meat and the bun is also thick, but not too thick. And when you put everything together, it ends up being very sizeable. It was so sizeable that I was only able to eat half of it that night. But I enjoyed it immensely. I like my burgers well done (I know, shame on me) and it was still incredibly juicy. Even though there’s a lot of bun, there’s not too much. The onions tasted even better than they looked. 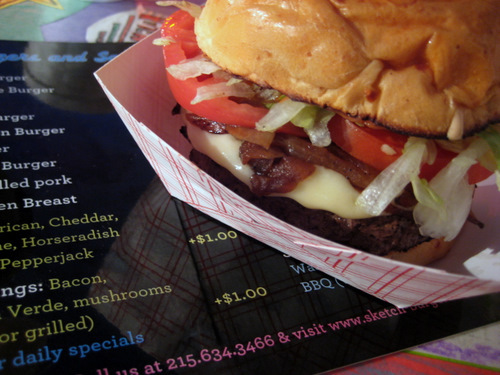 All in all, this is an enjoyable burger, some of the best burgers in all of Philadelphia. When I ate the other half the next day, even when it was cold, it was still delish. Although I did not sketch, since C is an artist, he left this little beauty for future Sketch visitors to enjoy. 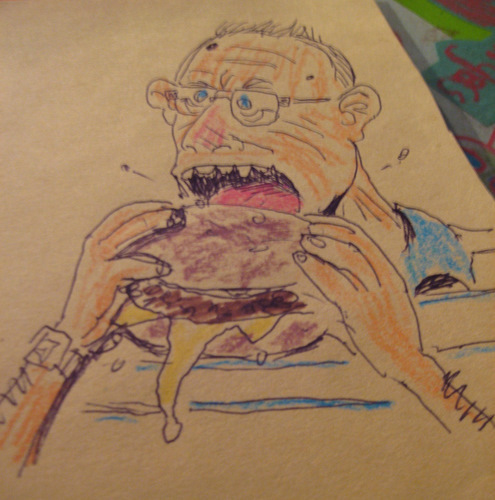 Note to readers, he made me pretend to hold a burger while he sketched this. So those are supposed to be my hands. I hope my hands in real life are a bit more attractive. Mmmm. I’ll look for the drawing the next time we are there. We love this place and I agree that you can’t go wrong with bacon and fried egg. Hope you had a chance to talk with the owners, too. They are super nice.